We are proud to announce that Cub Scout Pack 567 is now accepting both girls and boys kindergarten thru 5th grade. Cub Scouts celebrates family time, and family activities by inviting whole families to participate. For a long time, younger siblings and sisters have been allowed to participate in all our activities. They got to take part in the fun, but they missed out on belonging. 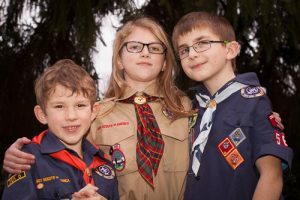 Cub Scouts has now added a Lion rank, so that younger siblings could join the Cub Scout Pack in kindergarten. And this year Cub Scouts is reaching out to the sisters with the Family Scouting Movement. Pack 567 in Kirkland believes in the importance of scouting in raising the leaders of tomorrow. It is because of this belief that we endeavor to make our pack accessible to ALL. We celebrate the decision of Boy Scouts to develop a Family Scouting Program. Pack 567 is now accepting both boys and girls ages kindergarten thru 5th grade. Anyone interested can email ChiefSeattle567@gmail.com, or go to BeAScout.org to register.